Steve Schlackman is a lawyer by profession and a photographer by choice. Fascinated by the magical world of photography since his youth, he honed this skill over time, meticulously pouring over all things photographic, technical and creative alike, with unstoppable enthusiasm. Steve’s passion for taking photographs was ignited early on, during a study-abroad trip to Paris, where he immersed himself in all things art historical. Diligence, a strong trait Schlackman is known for, paid off, and after daily meanderings at the Louvre, a great love for art emerged along with hundreds of photographs. These pictures proved to be early tributes to the urban landscape, and although they didn’t amount to full-on series, a seed was planted. The early 2000s saw the artist enrolled in night courses at the renowned International Center for Photography. His interest in the multi-faceted world of image-making showed in the diversity of classes he attended, from advanced darkroom techniques, to photojournalism, to portraiture. It was during his time at the ICP when Steve decided to cross the threshold from amateur to professional. Seeing Sebastiao Salgado’s photographs commissioned by the UNICEF during the late 1990s solidified this turning point for Steve, and, as they say, the rest is history. Ever since he can remember, Steve has lived in urban environments, so it comes as no surprise that his focus is on capturing as accurately and as candidly as possible city dwelling, whether it is through its architecture, its inhabitants, and most often, both. 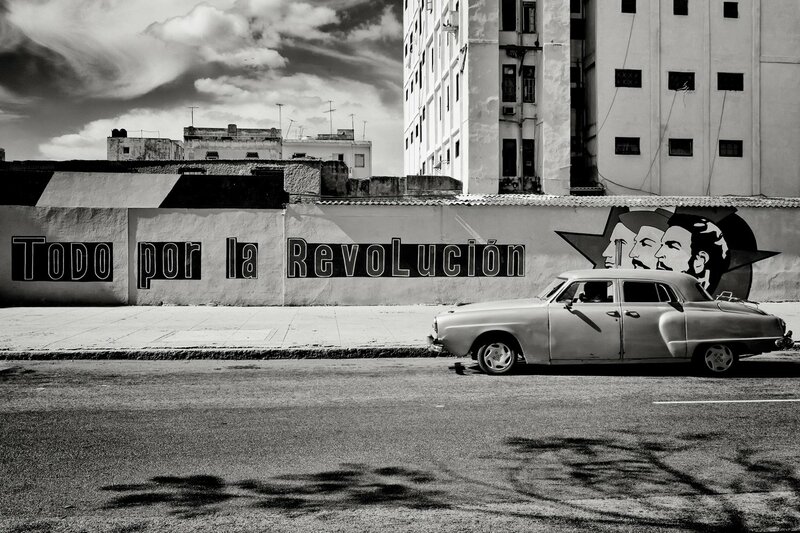 His latest series depict Havana’s cityscapes in 2011, the very year when Castro retired from political life. They crown a long-term video project, started in 2004 by a group of friends. When Steve was invited to come along to shoot behind-the-scenes, he took this opportunity to further explore the Cuban way of life, succeeding marvelously. 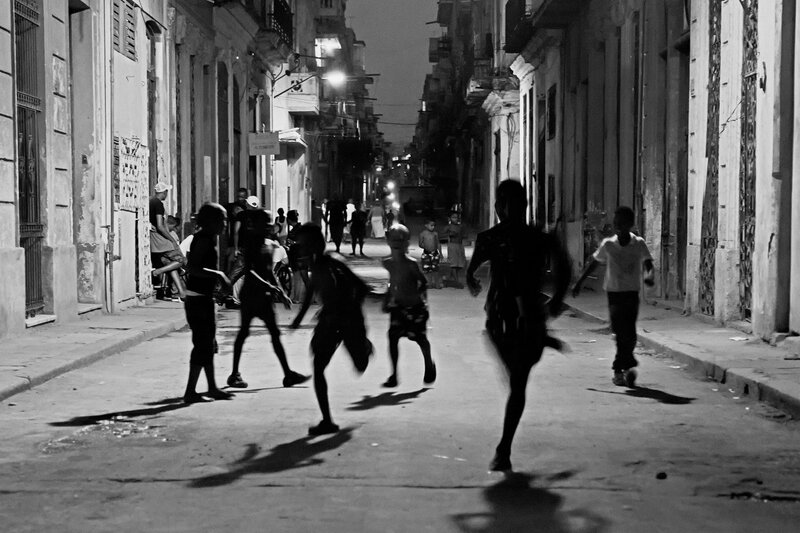 While the documentary’s aim was to bring visibility to a group of Santeria musicians, whose practice incorporates “La Clave” – a rhythmic pattern used in Lucumi religious rituals that also underlines different genres of popular Cuban music, Schlackman’s further pursued his interest in uncovering the spirit of humanity in his strong signature style: grainy black and white photographs of a culture suspended in time. The sense of timelessness is perhaps the most memorable feature of the series. 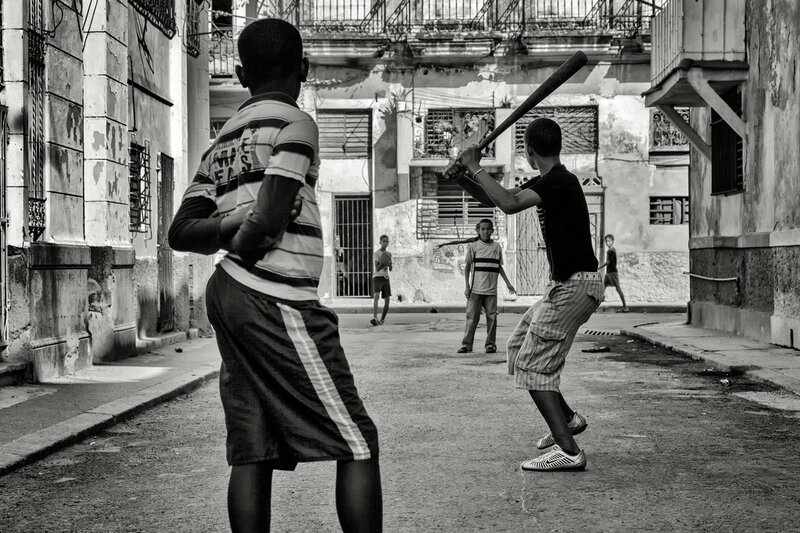 The omnipresent tension between the poor neighborhoods of the Cuban capital, as a result of political dictatorship, and the rich Afro-Cuban cultural roots of their inhabitants, whose wealth is represented by their music and feelings, is physically visible in Steve’s use of high contrast, a metaphoric touch on the subject of the light and darkness of the Afro-Cuban heritage. 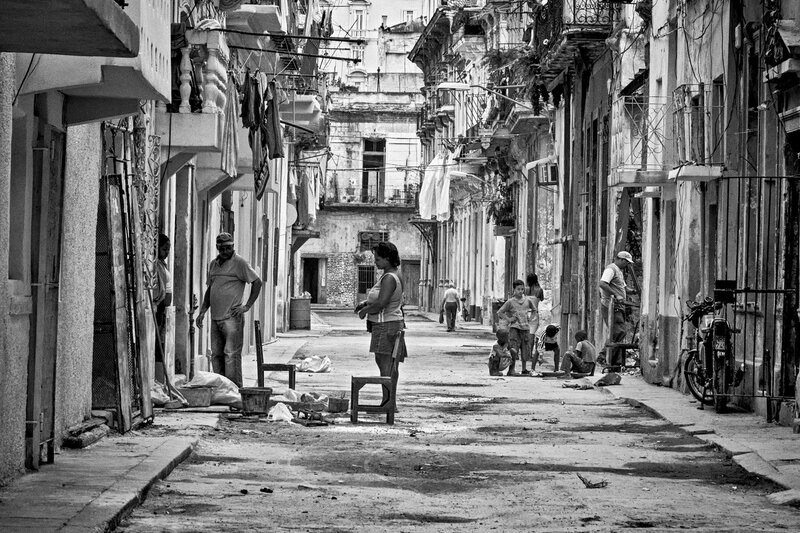 Although intentionally apolitical, the pictures speak volumes about the Cuban status quo and, appropriately, the eternal joy of living despite socio-political hardship. The streets are peppered with ‘yank tanks’ also known as classic American cars, serving as both regal reminders of a time past and of the infamous American embargo. In 1962, USA effectively cut trade between the two countries, leaving Cubans without an option for spare parts, so yank-tanks are essentially mechanically assembled mosaics of American and Soviet vehicles. Elements of a larger, more complex infrastructure, cars live, perhaps not so quietly, among the occasional pull carts, carriages and the newer brands of vehicles, even though the latter are still far and few between. Play, in and of itself a mode to survive the harsh reality, represents another subject Steve is keen on capturing. Whether it is adults playing dominoes, cards, musical instruments, or bands of kids flinging makeshift baseball bats, these activities are performed in communion, inadvertently ritualistic and therefore vital within the larger context of a tight-knit society. 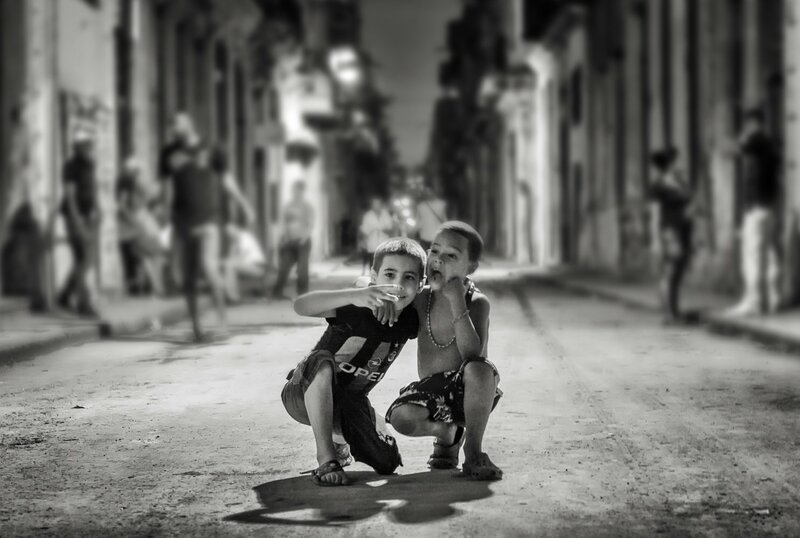 Children in particular hold a dear place in Steve’s vision of Cuba – they serve as symbols of idyllic purity and hope. The shimmery skin, the intense gaze, the sheer camaraderie and real belief in the momentous win, transfer to the viewer a strong feeling of reverie rarely found in urban photography. We are invited for a few minutes to contemplate children at play, a return to innocence again, where living is celebrated for one reason alone – that of simply being alive. © 2017 Emmanuel Fremin Gallery All Rights Reserved.